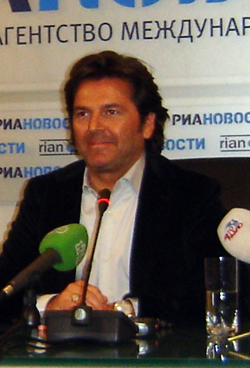 This press-conference was held for Thomas Anders on April, 22, 2009 in an office of the information agency "Ria-News". The style and expressions of Thomas and those who asked questions were kept almost as they are. Unfortunately, the interpreter didn’t know Russian language perfectly and couldn’t translate all questions to Thomas accurately. That’s why Thomas’ answers didn’t always correspond with the questions. However, the whole atmosphere of the conference was quite warm and sincere; Thomas had a nice mood and tried to answer all questions (even tricky ones) minutely and even gently. By the way, Thomas looked very good, he was fit and neat – a young gentleman with chuckling eyes and a bit tousled appearance. TA: Hello everybody! First of all, I wanna say I’m very happy to be here. And this is very special to me because my show tomorrow in Kremlin Palace will be the tenth show for me, and that means that no other foreign artist ever did more shows at the Kremlin Palace, so I was really surprised by that, to be honest, because I didn’t count it on every year. When I’m looking back, it’s now ten shows! And I’m very thankful for this, and thank you for being here, ladies and gentlemen! - Tell me, please, how do you spend this day? - Yes! How do you spend it? TA: To be really honest, I got up at 4 o’clock in the morning after 4 hours sleep. Then I went to the airport, and now I’m here, and the way from the airport to the press-conference took me even longer than the flight from Germany to Moscow! So, this is Moscow traffic, right? - Can you tell us about the program of the concert and the album that you’re representing now? Will you have old songs in the concert, or will there be new ones? TA: Well, all my concerts are in a certain way different. For sure there’ll be always a standard of the biggest hits, because this is what the people are waiting for. A concert with Thomas Anders without "You’re my heart, you’re my soul" wouldn’t be a concert at all. So, every time I’m working, even when I’m touring all over the world, and when I’m doing my private events, the concert changes every two years its concept as well. So, I pick up songs from the older "Modern Talking" times; I choose them, and I take songs from the solo Thomas Anders’ career, and I change them with other songs. This time is very special because I will sing a few songs from my forthcoming album. - Do you have plans in your musical creative work to cooperate with some instrumental bands like the one of Paul Mauriat or Glen Miller? Maybe, some collective records with them? TA: Oh, yes, yes! Yes, this is true. We were ascent the process of doing some shows with Glenn Miller, but this is, you know, specially for Germany, because this is a very big band, around twenty or twenty two people, musicians. We’re working on a special swing concept, but only for shows, not directly for an album. - Thomas, tell us, please, what is the reason of the second cancellation of your concert in Perm which had to take place in the end of April? Does it somehow attribute to the crisis, or there’re some other reasons? TA: Oh, this is a good question. So, I really have to answer this. Sometimes it happens that some promoters are doing a bit their own thinking and going their own way. From my side I was really aware and I would really love to do the concert in Perm. But we had one problem: we never had a contract with this guy. And he started selling tickets without even having a contract. And this is really hard for us, because my management is sitting in Germany and getting a contract with him, because we need a contract, we need all of the travel details and stuff like this. But at the end he cancelled it for whatever reason, and I have no clue. This makes me a kind of sad and upset because of fans who bought the tickets. So, from this point I can only give the advice that all the people who have interest for the shows and for the concerts, they should look at www.thomasanders.ru or www.thomas-anders.ru, because they’re very informed what’s going on on my site, www.thomas-anders.com, and there they can really read if this show will happen or not. So, this was a really bad circumstance we had and I can apologize from my side even if I had nothing to do with that because it was a problem of a contract. - Good afternoon! I’d want to ask one thing. You have a tradition to give Christmas concerts in churches in Germany. Do you have plans, as you’ve mentioned before, to record a Christmas DVD with a concert of Christmas songs performed in a church? Is this idea still alive? Thank you very much. TA: For the moment it’s not still alive, this idea, because I don’t have time to do another concert tour. I’ve been asked for doing some Christmas shows, but my schedule is really packed. But I was thinking about it, this is not the fact that I don’t wanna do this. For DVD you need a really perfect location, you need a really perfect church, where there’s an allowance to make a DVD. You can’t do it in every church in Germany, so I don’t know how the situation is here in Moscow or in Russia. It’s still in my mind, and it’s not gone, but not for this year. - Dear Thomas, my name is Sergey Biryukov, the newspaper "Trud". Tell us, please, who do you think you are mostly – Thomas Anders or… the label "Modern Talking"? And one more question: the issue of the reuniting of bands is very urgent nowadays in the world. I know that you’re strictly flat concerning the unification of your duet; nevertheless, are there some attempts to offer you a contract and some huge sums of money for the unification of your legendary band? Thank you. TA: So, the last question is pretty short to answer: NO! And the first one… I never felt I’m not "Modern Talking", because "Modern Talking" is a fantasy name. It’s a brand. And Thomas Anders is a human being. You know, Modern Talking didn’t breathe, didn’t eat, didn’t sleep and didn’t go to the toilet. I was a part of that group, but I don’t reflect myself as Modern Talking. - You sad "NO" – that means that nobody even asks you already, or there were some attempts to approach you and you said "NO"? TA: No-no, we were not talking at all, because we have completely opposite lives, and there’s no crossing in a way, so I think that people should really… in the memories of the people… "Modern Talking" and their music should stay in their minds and in their memory. But the 50% of it – it’s pretty much! – is still alive, still singing and performing! - Thomas, the company "KM" has a tricky question: whom of the Russian "stars" do you know, and if you know someone, whom do you consider to be really talented? TA: So, this is the question I’ve been really often asked, to be honest. We all know in Germany, definitely, TATU, or I know Alla Pugacheva. I know personally Philip Kirkorov. But sometimes when I’m watching MTV-Russia, I hear a lot of good music, but I can’t read the names. So, it makes it really difficult for me to know who is singing. - Good afternoon, Thomas! Thank you very much that you’ve come to us! I have a question to you. Few years ago, pretty long ago, together with "Chain Reaction" you have performed five songs, and one of them was "Out of the blue". However, no one of your fans could listen to it in a good quality. Don’t you have a plan to collect all these songs that were not recorded and to finally release them in order for us to listen to them and to take delight in them fully? TA: No, it’s not planned to release them. You know, I’m a kind of musician that really loves making music and to be in a studio. I have a lot of people whom I know, my close friends, and we work in the studio. My main part is to sing. And there’re so many songs on several servers, in so many studios, but a lot of these songs will never be recorded. Some friends ask me, "Let’s sing a song together", whatever… let’s make it together. But it’s just for fun. Maybe, this is a really good situation, because there was one work that was working out; this was a duet with Sandra, which will be released in the next weeks. Maybe, now we’ll have a chance to have a look at the video. - Ria-novosti, Irina Gordon. We would like to hear from Thomas something about the forthcoming album – what is it about? Maybe, it differs from others by its music or whatever? Or there’re some experiments? Thank you. TA: Well, you’ve just heard an example what does this music like. This is more Eurodance, Europop; it’s a completely different album than the last one, "Songs Forever". It was more into a concept, more in this very lounge-style. And the next album will be more into dance, more into commercial tunes. - On May there’ll be the next Eurovision contest in Moscow. As far as I know, you’ve been asked to be a presenter of the broadcast of this contest for Germany. Did you agree to do that? And how do you evaluate the opportunities of Germany, which is traditionally not very successful in this contest, and of the contest itself? Does it have some development prospects? So, we have a really good chance to be better than last year, but for me, to be really honest, it is not that important – to be in Top Ten or Top Five, because this is a great show. It’s a show for Europe and for all the European countries, most of them. So, we have a chance in between three hours just to look and to listen to the music in all of these countries, to see what’s going on there musically. - (The following question was asked on German, and the interpreter couldn’t understand it at all. The lady said on German that she was a representative of the Russian SIB site and that there’d be a festival of German culture and language in Novosibirsk on August. The question was if Thomas could take part in it as a special guest). No-no, this is a joke! She was asking for some shows in Novosibirsk; you know, this is my manager somewhere around, outside. This is his department. - The next question will be on Russian. RBK, an information agency. Thomas, tell us, please, did the financial crisis somehow affect your creative plans? Maybe, it has influenced the touring? Can we hear now a kind of Thomas Anders’ anti-crisis recipe? I think it is something for everybody worldwide, maybe not for the people in the jungle or whatever, but all other people were infected by the crisis. We see it every day in news, and we can read it in newspapers. But, to be honest, this economic crisis didn’t push me into the personal crisis at all. I think that for you in Russia it’s more special than for us, because when we just make a Schlagbaum (lift gate) on the political borders so many years ago… We’re really used to this kind of crisis. And we learned that it will always go up. After a deep valley you will have the chance to go on the mountain! I really think and I hope that tomorrow in my show nobody will think about economic crisis! TA: Yes, this is the way I think. First of all, we have to know and really should think about it. This is a show. No one is really thinking seriously to create a "star" for long terms. I don’t know how it works here in Russia, but in Germany none of these winners ever survived longer than two or three years. There were some winners whose period was only six or eight months. And we don’t remember the names anymore. So, for me definitely the best way to have a long term career is to learn it, to learn it really from the bottom. These young talents who are in the show, they have absolutely professional surroundings. And we’re old enough to know that life circumstances never will give us all perfect surroundings. So, these new singers, they’re addicted to this! They have always perfect marketing and perfect people around. It’s a perfect show and it’s a push from a really big TV-channel. And from that point on when this people have to concentrate on a new winner, then the former winner didn’t have time to learn in between one or one and half year how this business works, and so he’s lost! This is the main reason why it’s pretty hard for them to survive. - The question was if you watch these shows or not! TA: Sometimes. Sometimes I watch these shows, and sometimes I’m discussing with my wife when we’re at home. I really often say that these young people have to learn so much more. I’m in that business for forty years. I started at six. I had my first record contract in fifteen. That means I had nine years of development. When Modern Talking showed up, I was twenty or twenty one. It took me fifteen… or five to six years, and then I had a big, big career. I had so many ups and downs, and these ups and downs helped me in the end to stay where I stay now and to learn from all my experiences. Nobody can tell me that in between these shows in Germany, for five or four months, that you have a chance to learn in between four months, while other artists have to learn fifteen years. This is not possible. TA: I watch this show and I don’t switch it on just to watch Dieter Bohlen. But what he is saying of music is ninety percent right. I agree with him in so many things. But when you’re in Germany like me, when I’m in Germany, and I know all the things behind it, and I know him very well and I know why he is talking against one talent and for one talent. From the very beginning he is selecting which talent for him is good to produce and which one is not. He will never ever push a talent he can’t make money with. - Tell me, please, how will you prepare to the tomorrow concert? I have heard that you’re a bit sick. How are you planning to take treatment, or maybe you’re going to rest? And did you ever have a kind of friendship or whatever with Russian women? TA: I think that tomorrow will be a really great show. At the moment I have still a little problem – maybe you can hear it – with the nose; I’m an allergic because of blossoms in springtime, I don’t know the expression on English – pollen? Yes, so. To be honest, from your weather circumstances and from your springtime you’re at least four weeks behind Germany, so I don’t have the problem hopefully tomorrow in Moscow. This was the first part, right? Ok. The second part might be more interesting for you, because you don’t want to listen to my allergic problems. In all other human parts of my body I don’t have an allergy at all. I really love Russian women; they are very, very beautiful! There’re beautiful women in your country! You have so many worldwide models and really great women. You know, what is much more interesting for me that most of them are really nice, even if they’re not models. Once… I don’t wanna tell you the name, but once I was here in Moscow, and I just came to my hotel. My hotel suit was shown, and I entered the suit… My luggage was dropped down, and I was just looking. I saw big plates of food, and on a stand it was an evening gown, black from Gucci. I thought this was very kind of Gucci to give my wife such a present! I went to the sleeping-room, and the sleeping-room wasn’t done. So, I thought that here’s something wrong. I called at the lobby and said: "Are you pretty sure that this is my room?" And it was a room of a very known, worldwide known Russian model. But the major problem was that she wasn’t there! Anyway, I have a really funny story to tell you. And I didn’t take the Gucci gown! - Few years ago you have already came here to Russia and performed on a Red Square together with the band "Scorpions". As far as I know, you have quite friendly relations with Claus Meine. Don’t you have plans to record a joint project with "Scorpions"? Maybe, a song or an album? TA: No! We know each other, and sometimes we have shows. We’re in a show, and everybody is a part of it, so we had it some years ago on the Red Square. I think it was in 2003. I think that our music style is quite different. - Can I ask you for an autograph after the conference? TA: If this is your wish – definitely, no problems! - Thomas, don’t take my words wrongly, there was a second question for you! What are you planning to do before the concert? You’ve got all evening and a whole day tomorrow! TA: You know, this is a typical thinking that I have nothing to do just to make myself fresh for the concert! So, today there’s lot of more interviews, and the first interview tomorrow morning is at eleven. And then there’s the next one coming, and the next one coming, and the next one… Then I have my sound-check, and I think this sound-check will be till five, then I’m going back to the hotel, taking a shower and then – to the 2-hours show. On Friday I have a shooting for the German TV from eleven o’clock on. So, this is the complete day on Friday as well, and I’m going back on Saturday. It makes reason why my wife doesn’t join me so often when I’m touring. She says she knows how I act on stage, and on the other side she says: "To be alone I can be in Koblenz as well, so there’s no need to go somewhere to be alone". Now you’re surprised, isn’t it? - Do you have your favorite places in Moscow and what kinds of Russian food do you like? You told us about your packed schedule this time, but maybe during your previous visits you could see something – some night clubs, museums or something else? TA: I’m not so into clubs because when I had my show I really love the silence more. But I’m always invited for some restaurants, and my favorite food is the mixture between European and Asian food. And I always like it very spicy. - May I ask one more question, please?! A very small question!! - A small question: what ringtone do you have on your telephone? I don’t know… This is like a guitar or something like this. I don’t give my number! It’s a guitar from the IPhone. I’m not into the special ringtones, bla-bla-bla, because I need one specially – I have to hear it, it doesn’t have to be complicated. I’m not so into the ringtones. - "Geronimo’s Cadillac", the remix! TA: She has a good taste, and it’s a perfect answer! Эта пресс-конференция была дана Томасом Андерсом 22 апреля 2009 года в офисе информационного агентства "Риа-Новости". Стиль и язык Томаса и тех, кто задавал вопросы, я по возможности сохранила. К сожалению, переводчик не очень хорошо знал русский язык и не всегда мог с точностью перевести вопросы Томасу, поэтому ответы Томаса не всегда точно соответствовали задаваемым вопросам. Но в целом атмосфера конференции была очень теплой и искренней, у Томаса было прекрасное настроение, и он постарался подробно и даже как-то ласково ответить на все вопросы, даже на самые каверзные. Еще раз хочу отметить, что Томас выглядел очень хорошо – это был худощавый и подтянутый молодой джентльмен со смеющимися глазами и со слегка растрепанным видом. TA: Здравствуйте! Прежде всего хочу сказать вам, что я очень рад вновь быть здесь. Это – особенная встреча для меня, ведь завтра в Кремлевском Дворце я дам свой десятый по счету концерт! Это значит, что ни один другой зарубежный артист не давал на этой площадке больше концертов, чем я. Если честно, меня этот факт очень удивил, ведь я не веду подсчет своих концертов каждый год. А теперь, оглядываясь назад, я вижу, что дал здесь уже десять концертов! Я очень благодарен за это, и хотел бы поблагодарить всех вас, дамы и господа, за то, что все вы пришли сюда! Ну что ж, начнем игру! Аудитория молчит. Томас, оглядывая зал, улыбается: "О, так быстро все закончилось?" Наконец звучит первый вопрос: Скажите, как вы проводите этот день? TA: Если честно, я проснулся в 4 часа утра, проспав всего четыре часа. Потом отправился в аэропорт, и вот я здесь. Кстати, путь от местного аэропорта до нашей пресс-конференции занял больше времени, чем полет из Германии до Москвы! Вот оно, московское движение, да? - Расскажите, пожалуйста, о программе концерта и об альбоме, который Вы представляете. Будут на концерте старые песни или новые? TA: Ну, все мои концерты так или иначе отличаются друг от друга. Разумеется, тут будет и набор стандартных хитов, ведь люди ждут именно их. Концерт Томаса Андерса без "You’re my heart, you’re my soul" – это ж вообще не концерт! Так что я постоянно что-то меняю – хоть в турне по всему миру, хоть на частных мероприятиях; в общем, программа моих концертов меняется каждые два года. Итак, я выбираю песни из старого "Модерн Токинг" и компоную их с песнями времен моей сольной карьеры, порой заменяя ту или иную песню другой. Но на этот раз будет нечто особенное, ведь я спою несколько песен из моего будущего альбома. - Скажите, пожалуйста, в своем музыкальном творчестве планируете ли Вы сотрудничество с инструментальными ансамблями, например, такими, как у Поля Мориа или Глена Миллера? Какие-нибудь совместные записи с ними? TA: О, да-да! Да, это верно. Мы хотим подготовить несколько концертов с оркестром Глена Миллера, но все это планируется только для Германии, ведь этот оркестр весьма большой, в нем задействовано двадцать или двадцать два музыканта. Мы разрабатываем особую концепцию в стиле "свинг", но это лишь для шоу, не для какого-то конкретного альбома. - Томас, добрый день. Скажи, пожалуйста, по какой причине произошла уже вторая отмена концерта в Перми, который должен был состояться в конце апреля? Это как-то связано с кризисом, или есть другие причины? TA: Ох, хороший вопросик… И я действительно должен на него ответить. Бывает, что некоторые организаторы концертов имеют свое мнение на тот или иной счет и идут какими-то своими неведомыми путями. Я, со своей стороны, был полностью готов к концерту в Перми и был очень рад возможности выступить там. Но тут была одна загвоздка: у нас не было контракта с организатором. А он без всякого контракта уже начал продавать билеты! Было непросто все уладить, ведь моему менеджменту в Германии пришлось сесть и составить с ним контракт, ведь нам нужен этот контракт, так как в нем оговариваются условия перелета и все прочие детали. Но в конце концов он просто взял и разорвал с нами контракт, причем я понятия не имею, почему. Такие вещи очень расстраивают меня, ведь мои поклонники уже купили билеты на концерт! В таких обстоятельствах я могу лишь дать совет всем тем людям, которые интересуются моими концертами: загляните на сайт www.thomasanders.ru или www.thomas-anders.ru, ведь там знают, что происходит на моем личном сайте, www.thomas-anders.com, и там вы сможете прочесть, состоится то или иное шоу или нет. В общем, это был пренеприятный случай, и я хотел бы извиниться перед вами, хоть все случилось и не по моей вине – это была проблема с контрактом. - Здравствуйте! Я хотела спросить: Вы традиционно под Рождество в Германии даете рождественские концерты в церквях. Не планируете ли Вы, как Вы однажды уже упоминали, выпустить рождественский ДВД с концертом рождественских песен в церкви? Жива ли еще эта идея? Спасибо большое. TA: На этот момент идея уже не жива, так как у меня нет времени еще на один концертный тур. Меня просили выступить с несколькими рождественскими концертами, но у меня слишком плотное расписание. Однако я думал об этом, и нельзя сказать, что я этого не хочу. Вообще для записи ДВД необходимо идеальное помещение; это должна быть церковь с идеальным звуком, в которой, к тому же, разрешены съемки. Вы не можете производить съемку в любой церкви в Германии – не знаю, как с этим обстоит дело в Москве или России в целом. Я все еще думаю об этом, и я не отказывался от этой идеи, но не в этом году. - Дорогой Томас, Вас приветствует Сергей Бирюков, газета "Труд". Скажите, пожалуйста, кем Вы себя все-таки больше осознаете – Томасом Андерсом или лейблом "Модерн Токинг"? И еще вопрос вдогонку: во всем мире всегда очень актуальна тема воссоединения групп. Я знаю, что Вы – категорический противник воссоединения Вашего дуэта; тем не менее, не продолжаются ли попытки предложить Вам контракт, какие-то большие суммы денег за воссоединение вашей легендарной группы? Спасибо. TA: На последний вопрос ответ будет очень коротким: НЕТ! А вот на первый вопрос… Я никогда не чувствовал, что я не "Модерн Токинг", потому что "Модерн Токинг" – это вымышленный персонаж. Это торговая марка. А Томас Андерс – это живой человек. Знаете, "Модерн Токинг" не может дышать, он не ест, не спит и не ходит в туалет. Я был частью этой группы, но я не считаю себя "Модерн Токинг". - Я бы все-таки хотел уточнить: Вы сказали "Нет" на первый вопрос. Это значит, что к Вам уже даже и не обращаются с ним, или все-таки были какие-то попытки, и Вы сказали "Нет"? TA: Нет-нет, мы вообще не говорили об этом, ведь у нас теперь полностью разная жизнь, и мы вообще никак не пересекаемся. Так что я думаю, что люди должны… в своей памяти… В общем, "Модерн Токинг" и их музыка должны остаться у них в душе и в памяти. Но 50% этого дуэта – довольно большая часть, кстати! – все еще жива, эта часть все еще поет и выступает на сцене! - Томас, это компания "КМ", вопрос на засыпку. Кого из российских "звезд" Вы знаете, и если знаете, то кого из них считаете по-настоящему талантливым? Спасибо. TA: Если честно, этот вопрос мне задают довольно часто. В Германии все мы, определенно, знаем ТАТУ; я также знаю Аллу Пугачеву. Я лично знаком с Филиппом Киркоровым. Порой, когда я смотрю MTV-Russia, я слышу там много хорошей музыки, но я не могу прочесть имена исполнителей. Поэтому мне трудно определить, кто поет ту или иную песню. - Добрый день, Томас. Большое спасибо, что Вы приехали к нам. У меня такой вопрос. Несколько лет назад, достаточно давно, вместе с "Chain Reaction" Вы спели пять песен, одна из них была "Out of the blue". Но никто из Ваших поклонников не слышал ее в хорошем качестве. Не планируете ли Вы все Ваши песни, которые не были выпущены на пластинках, все-таки выпустить, чтобы мы их могли услышать и насладиться ими в полной мере? TA: Нет, я не планирую их выпускать. Знаете, я – музыкант, который по-настоящему любит творить музыку и работать в студии. У меня есть множество знакомых и близких друзей, и мы вместе работаем в студии. Моя основная задача – петь. Есть море самых разных песен на разных сайтах, в разных студиях, но многие из этих песен никогда не будут опубликованы. Порой друзья говорят мне: "Давай споем что-нибудь вместе", или что-то в этом роде… Они хотят сделать что-то вместе со мной. Но это для нас просто развлечение. Думаю, сейчас настал вполне подходящий момент, чтобы показать вам одну совместную работу, которая все-таки будет выпущена: это дуэт с Сандрой, который увидит свет в течение нескольких недель. Может, сейчас мы сможем взглянуть на видео? - Риа-Новости, Ирина Гордон. Хотелось бы, чтобы Томас все-таки рассказал про предстоящий альбом – о чем он? Может быть, он чем-то – музыкой? – отличается, какие-то эксперименты? Спасибо. TA: Ну, вы только что слышали пример того, что это будет за музыка. Скорее, это будет Евродэнс или Европоп. Это будет совсем другой альбом, нежели предыдущий, "Songs Forever". Тот альбом был более концептуальным, выдержанным в лаунж-стиле. Зато следующий альбом будет танцевальным, более в коммерческом духе. - В мае состоится очередной конкурс "Евровидение" в Москве. Насколько я знаю, Вам предложили быть ведущим трансляции конкурса для Германии. Согласились ли Вы, и как Вы оцениваете перспективы Германии, которая традиционно не очень успешно выступает на этом конкурсе, и конкурса в целом – какие у него перспективы развития? Так что у нас есть все возможности для того, чтобы проявить себя лучше, чем в прошлом году. Однако, если честно, для меня это не так уж важно – попадем мы в десятку или пятерку лучших или нет. Ведь это – замечательное шоу. Это – шоу для Европы и всех европейских стран, – по крайней мере, для большинства из них. И у нас есть возможность в течение трех часов смотреть на экран и слушать музыку, представленную этими странами, быть в курсе всех музыкальных событий этих стран. - (Следующий вопрос был задан по-немецки, и переводчик не понял ни слова. Дама сказала, что она представляет русский сайт группы Systems In Blue, и что в августе в Новосибирске пройдет фестиваль немецкой культуры и языка. Вопрос был в том, не примет ли Томас участие в нем в качестве особо приглашенного гостя). Она спрашивала о каких-то выступлениях в Новосибирске. Знаете, тут где-то поблизости бродит мой менеджер; этот вопрос в его компетенции. - Вопрос будет на русском. РБК, информационное агентство. Томас, скажите, как-то кризис финансовый затронул Ваши творческие планы? Может быть, повлиял как-то на гастроли? И можем ли мы сейчас услышать какой-то антикризисный рецепт от Томаса Андерса? Думаю, что это коснулось всех людей в мире, и обошло стороной разве что тех, кто живет в джунглях. А так все люди так или иначе испытали на себе влияние кризиса. Мы каждый день видим это по телевизору в новостях, читаем об этом в газетах. Но, если честно, этот экономический кризис ни в коей мере не стал моим личным кризисом. Думаю, что для вас в России это немножко не так, как для нас, ведь после того, как много лет назад на нашей общей политической границе появился шлагбаум… В общем, мы уже привыкли к этому кризису. И мы поняли, что ситуация обязательно будет улучшаться. После глубокой долины у нас есть шанс забраться на вершину горы! Я искренне верю и надеюсь, что завтра на концерте никто даже и не вспомнит об экономическом кризисе! - Томас, вопрос по поводу телешоу, которое проходит в Германии. Меня интересует, наблюдаете ли Вы за ходом шоу "Германия ищет суперзвезду" или "Суперталант", и если да, согласны ли Вы с мнением жюри? То есть насчет того, кто победил? Может быть, у Вас есть какое-то альтернативное мнение об участниках, и Вы считаете, что должен был победить совершенно другой человек? И третий вопрос: считаете ли Вы, что данные шоу нужны, ведь артистам в 70-е годы приходилось проходить очень долгий путь становления артистом, и, может быть, благодаря этому они оставались долго на вершине популярности? А звезды, которые взлетают благодаря этому шоу, могут оказаться звездами-однодневками, у которых голова вскружилась от успеха, и после этого они так же быстро падают вниз. TA: Да, я тоже так думаю. Прежде всего, вы должны знать кое-что и подумать вот над чем. Это – шоу. И там никто всерьез не задумывается над тем, чтобы зажечь долгоиграющую "звезду". Не знаю, как обстоят с этим дела у вас в России, но в Германии никто из победителей не смог продержаться на плаву дольше двух-трех лет. Некоторые из них вообще погасли через шесть-восемь месяцев. И мы уже даже не помним, как их звали-то. Поэтому для меня, определенно, лучший путь к долгой и успешной карьере – это учиться. Учиться всерьез, начиная с самых основ. Эти юные таланты – участники шоу – получают крутое и профессиональное оборудование, самые лучшие условия. Но мы-то не первый день живем и знаем, что в жизни у нас далеко не всегда будет все самое лучшее и совершенное. А ведь эти юные певцы привыкают ко всему этому! Для них всегда превосходно организован маркетинг, их окружают настоящие профессионалы. Это – крутое шоу, освещаемое по-настоящему крутым телеканалом. Но когда все эти люди фокусируют свое внимание на новом победителе, прошлый победитель, не имея времени за год или полтора хорошенько подготовиться и поучиться этому бизнесу, просто теряется и уходит в никуда. Это – главная причина, почему им так трудно удержаться на плаву. - Вопрос был – Вы смотрите эти шоу или не смотрите? Первый вопрос. TA: Иногда. Время от времени я смотрю эти шоу, и порой мы обсуждаем их с женой, когда мы дома. Я часто повторяю, что этим молодым людям еще много чему надо было бы поучиться. Я в этом бизнесе уже сорок лет. Я начал в шесть. А в пятнадцать подписал свой первый контракт. Это значит, что у меня было девять лет на то, чтобы учиться и развиваться. К моменту появления "Модерн Токинг" мне было двадцать или двадцать один год. Это заняло у меня пятнадцать или шестнадцать лет, и лишь тогда моя карьера пошла в гору. У меня было множество взлетов и падений, и все они помогли мне в конечном итоге достичь того, чего я достиг, и извлечь множество уроков из моего жизненного опыта. Никто не убедит меня в том, что за время, которое проходит между этими немецкими шоу, то есть за четыре-пять месяцев можно реально чему-то научиться, в то время как другие артисты учатся по пятнадцать лет. Это просто невозможно. TA: Я смотрю шоу, и я включаю телевизор не для того, чтобы полюбоваться на Дитера Болена. Однако то, что он говорит по поводу музыки, на девяносто процентов верно. Я во многом согласен с ним. Но если вы живете в Германии, как я, – живя в Германии, я знаю всю эту кухню изнутри. Я знаю его очень хорошо и понимаю, почему он ратует за один талант и отвергает другой. С самого начала он выбирает, кого он сможет продюсировать, а кого не сможет. Он никогда не будет продвигать человека, если не сможет на нем заработать денег. - Расскажите, пожалуйста, как Вы будете готовиться к завтрашнему концерту? Я слышала, что Вы немного приболели – как Вы будете лечиться, или, может быть, Вы собираетесь отдохнуть? И скажите, пожалуйста: когда-нибудь была ли у Вас какая-нибудь дружба или что-то более того с русскими женщинами? TA: Уверен, что завтра будет великолепное шоу. Сейчас у меня действительно есть небольшие проблемы – наверное, это слышно по моему голосу – с носом; у меня аллергия на цветы, которые распускаются весной, не знаю, как это по-английски – пыльца? Да, на нее. Честно говоря, ваша погода и ваша весна отстает от Германии по крайней мере на четыре недели, поэтому я надеюсь, что в Москве я к завтрашнему дню уже поправлюсь. Это был первый вопрос, верно? Отлично. Думаю, что вторая часть вопроса вам куда интереснее, так как вы вряд ли захотите выслушивать мои жалобы на аллергию. Уверяю вас: во всех остальных частях тела у меня нет никакой аллергии! Мне действительно нравятся русские женщины; они очень, очень красивые! У вас в стране живут такие красавицы! В вашей стране родилось множество моделей с мировым именем и множество великих женщин. Но знаете, для меня гораздо важнее то, что большинство ваших женщин – очень хорошие люди, даже если они и не модели. Однажды… Не буду уточнять, про кого эта история, но однажды, будучи в Москве, я отправился в гостиницу. Мне показали мой номер, и я вошел в него. Мой багаж остался внизу, я лишь зашел посмотреть свои комнаты. И что же я увидел? Там стояли большие блюда с едой, а на вешалке висело черное вечернее платье от Гуччи. Я подумал: как это мило со стороны Гуччи – подарить моей жене такой подарок! Затем я зашел в спальню и увидел, что постель неубрана. Тогда-то я и смекнул, что здесь что-то не то. Я позвонил в приемную гостиницы и спросил: "Вы уверены, что это мой номер?" Оказалось, что этот номер принадлежал всемирно известной русской модели. Но главной-то проблемой было то, что ее самой там не было! В любом случае, это был презабавный эпизод! Кстати, то платье от Гуччи я так и оставил там. - Несколько лет назад Вы уже приезжали сюда в Россию и выступали на Красной Площади с группой "Скорпионз". С Клаусом Майне, как мне известно, Вы поддерживаете дружеские отношения; не планируете ли Вы записать с группой "Скорпионз" какой-то проект, сделать какую-то песню или альбом? Спасибо. TA: Нет! Мы знаем друг друга, и иногда выступаем вместе. Мы выступаем в шоу, и кроме нас там есть и другие участники; такого рода шоу было несколько лет назад на Красной Площади. Думаю, это было в 2003-м году. Но все-таки у нас слишком разные музыкальные стили! - Скажите, можно после пресс-конференции подойти и взять у Вас автограф? TA: Если таково Ваше желание – пожалуйста, без проблем! - Томас, не поймите меня превратно, но там был еще второй вопрос. Чем же Вы собираетесь заняться перед концертом? У Вас есть целый день и целый вечер! TA: Это типичное мышление, что мне больше нечего делать, кроме как развлекаться и отдыхать перед концертом! А мне вообще-то сегодня предстоит дать еще несколько интервью, к тому же завтра первое интервью будет в одиннадцать часов утра, а после него – еще одно, потом еще одно, и так далее… Затем будет репетиция – думаю, она продлится до пяти вечера, потом я вернусь в гостиницу и приму душ, а потом буду два часа петь для вас. В пятницу у меня съемки для немецкого ТВ с одиннадцати часов утра. Так что вся пятница также будет занята, и домой я вернусь лишь в субботу. Именно по этой причине моя жена не ездит со мной на гастроли слишком часто. Она и так знает, как я выступаю на сцене; к тому же, по ее словам, побыть в одиночестве она может и в Кобленце – для этого необязательно куда-то ехать. - Есть ли у Вас в Москве любимые места, и что Вам нравится из русской еды? Вы сейчас рассказали о своем напряженном графике в этот приезд, а в прошлые разы удавалось ли Вам что-то посетить? Может быть, какие-то ночные клубы, музеи или что-то еще? TA: Я не любитель клубов, так как после концертов мне действительно необходима тишина. Но меня постоянно приглашают в какие-нибудь рестораны, и моя любимая еда – это смесь европейской и азиатской кухни. И еще я очень люблю острое! - А можно последний вопрос? Маленький!! - Маленький вопросик: какой у Вас рингтон на телефоне? Я не знаю… Там какая-то гитара, или что-то в этом роде. Но я не дам свой номер! (Томас достал телефон, повертел в руках и спрятал его обратно). Это гитарная музыка для IPhone. Я не гоняюсь за какими-то особыми рингтонами и прочими прибамбасами; мне нужно, чтобы телефон звонил, чтоб я его слышал, и чтобы мелодия не была чересчур замысловатой. Я не увлекаюсь всякими там рингтонами. Кстати, а какой у Вас рингтон? TA: У нее хороший вкус, и это – отличный ответ!